Phones at the ready: Here are the best must-snap cocktails from around the world. From volcanic vessels erupting at tiki bars in Paris to cereal-inspired boozy ice cubes in Chicago, we’ve rounded up the world’s wackiest and most wonderful-looking cocktails. Love dinos? There’s a cocktail bar in Sydney with a photogenic treat for you. Want to drink something from a lightbulb? You’re in luck. These bizarre and often highly technical creations—no simple martini recipes here!—are guaranteed to up your “likes” game. And before you get ’gramming, check out our tips for taking perfect food pics. Yes, it’s a cocktail in a light bulb—and isn’t it the prettiest cocktail in a light bulb you’ve ever seen? A heady floral mix of fresh lemon juice, thyme, pear liqueur, rose water plus The Botanist gin and a splash of dry vermouth make this one bright idea indeed. This baby’s bound to make a splash on your feed. A refreshing medley of grapefruit and chamomile-infused gin with tonic and cucumber, it comes with two straws—and a very drunk (fake) goldfish bobbing around inside. This elegant, antique-inspired tipple is perfect for sharing with mates (ideally the ones who can handle their liquor). A potent concoction of absinthe, gin, blue curaçao, lillet blanc and lemon juice cascades from this absinthe ‘fountain,’ which will have you seeing multiple blue fairies by the end of the night. If it’s a spicy kick you’re after, this deconstructed bloody mary should do the job. Don’t worry: That fleshy yolk is actually clarified tomato juice floating in a sea of horseradish vodka and all the usual ingredients. Slurp it back in one and that hangover will be but a distant memory. Best ending #cocktail ever #prairieoyster at the #69colebrookerow. Be transported back to the Prohibition era with this elaborate boozy homage to F. Scott Fitzgerald. A tongue-tingling mix of Macallan amber whiskey, ramazzotti amaro, truffle honey and lavender bitters, it arrives under a bell jar filled with billowing vanilla and chocolate tobacco-flavoured smoke, plus a chunk of blue cheese for good measure. How dainty: A cocktail in an egg shell, cradled by a mossy bird’s nest. But don’t be fooled by the delicate vessel, this little number packs an absinthe-flavored punch, which thankfully is softened by the cachaça and condensed milk. Served inside a hollow sphere of tear-drop–shaped ice, this twist on a Manhattan features Bénédictine, Bulleit bourbon, vermouth and angostura bitters. The bartender breaks the ice just before serving. This is probably the closest you’ll ever get to sipping a sunset. Fresh fruit juice, vodka, Bacardi and Butlers Liqueur are frozen and blended into an ice slushie then layered to make this retro-lookin’ dreamboat of a drink. It’s all about the flaming rum with this volcanic eruption of a cocktail. The tiki-inspired tipple contains cognac, gin and rum, so expect to be crying “Aloha!” at the floral-shirted bartenders before the night is over. On the right we have El Draque, described as “just another Mojito”—but believe us, it’s anything but. That suspicious-looking green dollop is a delicious mint, apple, baking soda and xylitol paste. (We’re assured the toothbrushes aren’t pre-used). The shimmering beauty on the left is a mix of Guatemalan rum, Pedro Ximenez and Amontillado sherry, vanilla and black garlic. Yum. In the heat of the Istanbul sun, an popsicle cocktail featuring vodka, dark chocolate liqueur, blueberry, strawberry and lemon is just what the doctor ordered—just keep its boozy contents secret from your mom. These adorable dinosaurs bobbing in a sea of ratu spiced rum, Jurassic Juice, Pine Nut syrup and lime might not be the most edible of garnishes, but they are hella cute. This ethereal woodland arrangement is in fact a gorgeous gin-based tipple, topped with chamomile syrup, sparkling wine, campari and vanilla granita, plus basil, orange blossom, winter thaw and lilac. Even the petals are edible. Serious flower power. 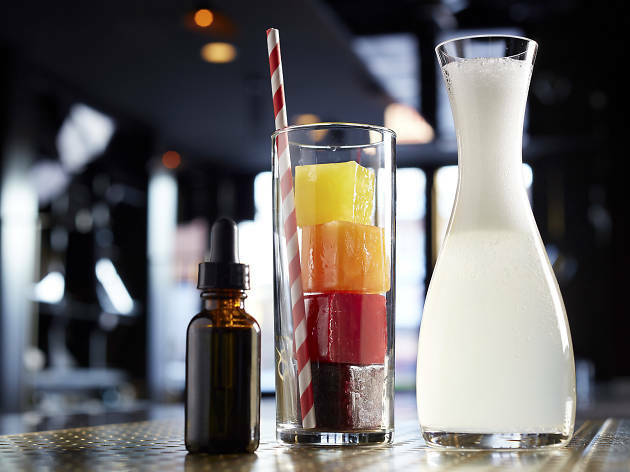 Though inspired by the flavors of children’s cereal Trix, this rainbow-colored beverage is strictly adults only. 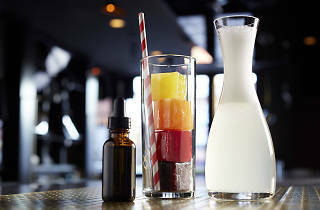 The four stacked cubes are soaked in a carafe of refreshing lime juice, soda, house-made mint bitters and the all-important gin. As the cubes melt, the fruity flavour intensifies—it’s anything but square. One of our favorites, the "Silly Rabbit". Does the though of coffee and booze put you in drinks heaven? Then let Eau De Vie take you on the ultimate caffeinated journey. They offer martini-lovers a choice of vodka, rum or whisky and add a chilled layer of saffron and vanilla mousse to the mix. Plus, all that atmospheric dry ice will have you swooning before you’ve even had your first sip.